Where you watch your media is crucial to how you experience it. Your surroundings definitely affect how it feels to enjoy a favorite film or binge-watch a new TV show. So if 2018 is the year you decide to upgrade your home with a private cinema, there are three major factors to consider. To create the ultimate home theater design for your Portland, Oregon living space, read on below to see the essentials on our list. When it comes to watching movies, the quality of the screen and projector definitely makes a big difference. A 4K Ultra HD flat screen is key to having the best viewing experience possible. You can get as close as possible to it, and see virtually zero pixels. Another great option is pairing a roll-down screen with a projector that can lower from the ceiling. This will still have the great 4K resolution, and can be easily hidden out of the way when not in use and can go great with the décor or theme. There’s nothing worse than having a massive sun glare ruin a scene or mess up a whole movie because you can’t see a thing. But imagine having control over your exactly how much lighting you allow into your home theater. If you have gorgeous floor-to-ceiling windows, they can create that brightness that will make movie-watching impossible. But with automated window treatments, you can easily press a button and solve the problem. Simply use your smartphone or another smart device to lower your motorized shades, with an option for dual shading. This means one set of shades can be “blackout” and give your room a true theater-feel. The other set can be more visually appealing and useful when you’re not watching something. If you’re looking for less of a dedicated home theater and more of a multi-purpose media room, lighting control can also be ideal. You can have complete control over how much light is too much to hinder the media, and if you need more to see your way around. Dim or brighten with ease, and all from one source. A film or show’s audio is fundamental to the immersive atmosphere. Quality, high-end speakers are necessary to complete the home theater design. But what kind are the right kind? You could go the more traditional route and get amazing standing speakers. While large, they give great sound and could go well with a “theatrical” theme. There are also many hidden speaker options, such as small cabinet ones or in-wall speakers that blend in seamlessly with the interior design. Either way, you can place the speakers evenly around the room to create the perfect surround sound. 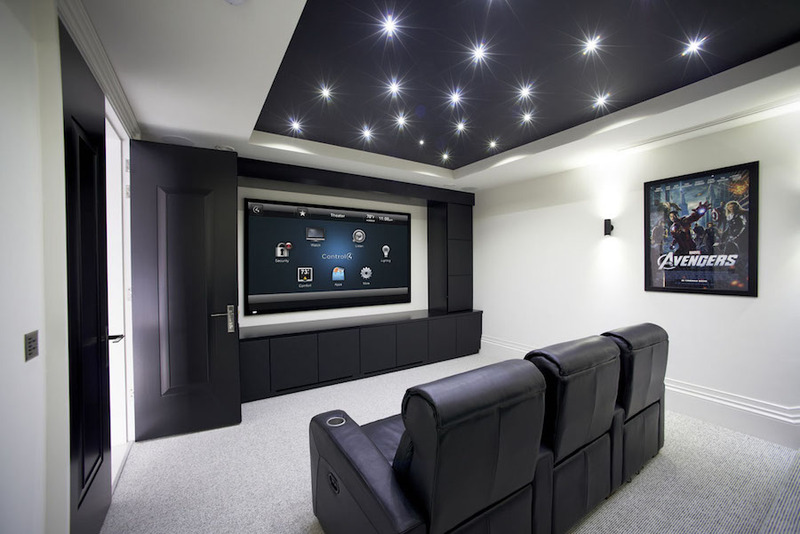 Interested in learning more about how to put together an awesome media room design? Give us a call or fill out our online contact form to schedule a consultation. Our team would love to hear from you!